We are not merely surrounded by nature, but enclosed within it, even if a seamless existence is obstructed by the erection of pillars and walls. That isn’t to say that self-confinement indoors isn’t suffocating. Nor, on the other end, does it imply pure living is exclusive to residing in a stony dwelling left agape to the wilderness. However, there exists a faulted notion that nature is a mere adjunct to a life in the built environment; as though the two are separate, mutually-exclusive worlds. The latter a foggy, safe recluse; offering a comfortable if claustrophobic existence, that is all too often believed an alternative, indeed even a superior to, the ancient, untamed world of nature. Because of this, many of us shun ourselves from nature as though it were something we could shut out. Luckily, it isn’t. Interaction with nature is crucial to optimal health and in neglecting that interaction we sever the most beautiful of our lifelines. Healthy exposure to nature extends beyond outdoor recreation and sidewalk dining. In fact, it may beneficial to indulge your productive impulses “en plein air” more than any other activity. Why? Because, working outdoors improves focus, increases productivity, and – Homer’s Artists Sketching in the White Mountains was created outside, was it not? 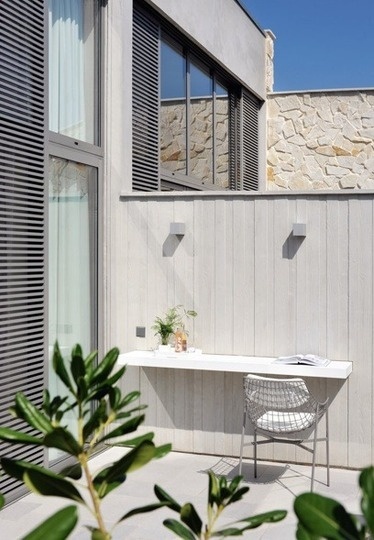 An outdoor office can be minimally constructed by simply placing your desk and chair outdoors. Suspended desks may be created with the installation of roomy shelves on your exterior walls. Sheds, pavilions, and sun-rooms can be converted into creative spaces and left open to the elements for inspiration. But perhaps the best way to stake your creative claim in nature is to simply take a seat. Designed by Jerusalem-based Adi Kalina (as part of her graduation thesis, no less), these chairs come in white or dark wood stain, with backs ascending to the far reaches of the sky – overhanging just enough to allow for adequate shade. 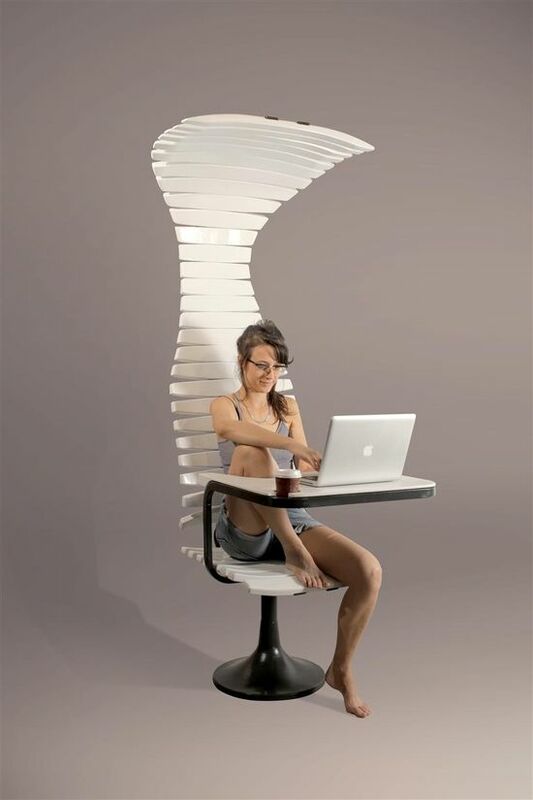 The chair is equipped with a small desk, which has a corner nook perfect for a cup of coffee or a meshed cylinder full of utensils when long-hand is desired.